It's Time could just as well have been titled It's Overdue. It's long been time for one of today's most powerful and expressive musicians to break the chains of relative commercial obscurity. Time to seize the reins of blues leadership, just as his father, Jimmy Rogers, did in the 1940s. Masters Eddie Kramer (engineer for Hendrix, Zeppelin, Woodstock etc. ), Chris "Whipper" Layton and Tommy Shannon (of Double Trouble) and Mike Finnigan (organ in the bands of Etta James, Taj Mahal and CSN&Y) are all onboard to give Jimmy the nudge he needs to clear the launching pad. It's Time. Customer Reviews (4.67 Stars) 12 person(s) rated this product. Its not Stevie Ray Vaughn but with Double Trouble behind him, Jimmy D. Lane is a great runner up. I only hope the stay together because they produce a really tight sound. This is the way blues should sound. If yer in the mood for some blues, this will fix ya up. Highly recommended. I love this SACD/CD. I've been a Stevie Ray Vaughan fan for a long time - for anyone who is, you'll really enjoy this. I mean his guitar, his guitar is hot. 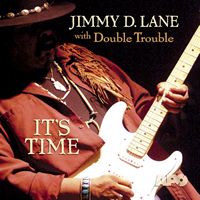 Jimmy D.Lane makes me think of what Stevie Ray Vaughan would be doing if he had lived. His style and talent is few and far between. I like JD's playing and his choice of songs on this album was very good. He isn't up there with Stevie or Jimmy, but I wouldn't kick him out of my SACD player for eatin' crackers. One of the best blues disk that I have and surely best sounding. When compared to other SACDs, the quality of this recording is not up to par. The music is great, but if you have high-end audio equipment you will be distracted by the lack of richness. The vocals are drowned out by the music and there are recording artifacts that are clearly discernable. Fantastic find, Jimmy D. Lane. This guy is in the SRV, Hendrix, Albert King,Kenny Wayne Shepperd, leauge.